After a long, tiring day at work, there are few things most of us want more than a good night’s sleep. 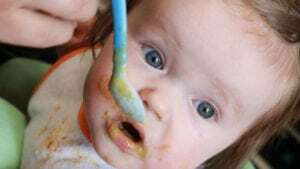 But while sleep is supposed to provide a restorative break from the rigors of working life, for many it has become a literal nightmare of job-related anxiety and stress. We surveyed 1,750 working American adults about their dreams, and found that for most people, work isn’t left at the office — it’s invading our dreams and making us more stressed out. 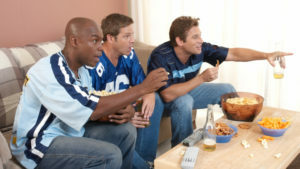 In fact, we found that 64% of Americans have had a nightmare about their job, waking up feeling stressed and worried. Most Americans have had stressful, traumatic dreams about work, ruining their sleep and adding to their anxiety. 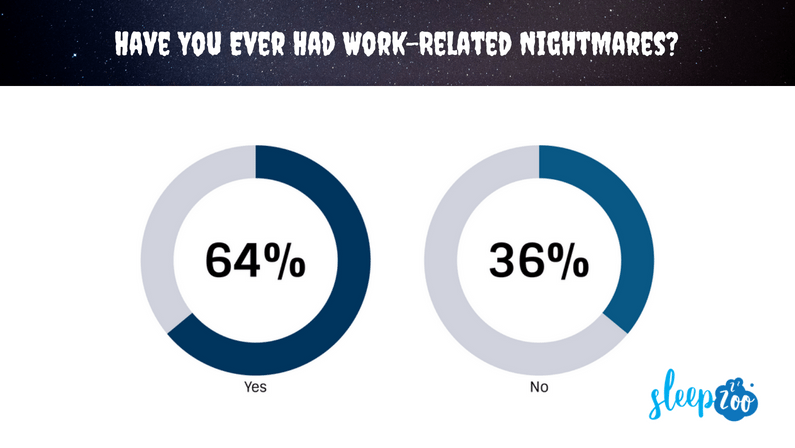 64% of Americans say they’ve had a job-related nightmare. Studies have found that many people rate their jobs as their biggest source of stress in life, and with stress being a major cause of nightmares, it’s not surprising to see that so many of us are having tense dreams about work. While we might think having a bad dream isn’t a big deal, studies have shown they can lead to problems like anxiety, depression, insomnia, headaches, and more. In fact, people who have regular nightmares are five times likelier to have mental health issues, like depression. From dreaming about being late for work to getting fired, job-related nightmares often feel very real and can be overwhelming. Okay, so dreaming about getting it on with a coworker might not always be a nightmare, but a lot of Americans are having very intense bad dreams about work. This makes sense because we tend to dream about things that are troubling us, and work is a huge source of stress for many people (more on that later). What do these nightmares about work really mean, though? It depends on who you ask. 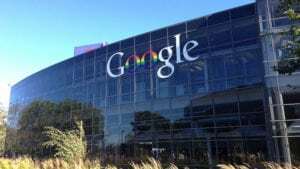 For example, dream analyst Lauri Loewenberg says dreaming about showing up to work naked isn’t actually about fear of being naked but instead is related to “anxiety being in a situation in which all eyes are on us,” such as during a presentation or an interview. On the other hand, a nightmare about being late to work could be a sign that you’re worried about missing out on an opportunity in your career. 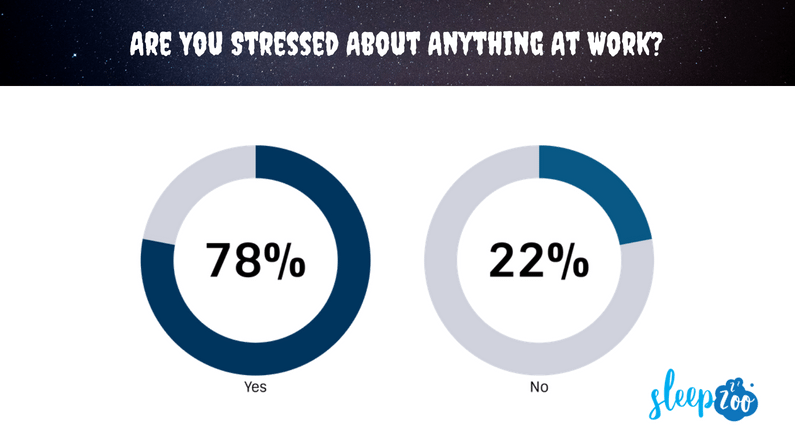 78% of Americans say they are stressed about something at work right now. 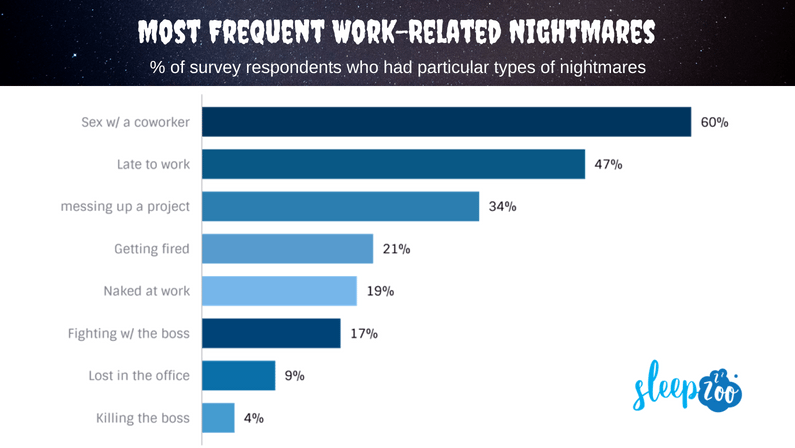 With nearly 4 out of 5 adults stressed out about work, it’s no wonder so many of us are having job-related nightmares. These numbers are similar to what Harris Interactive surveys have found in the past. The unemployment rate might be falling, but workplace stress is still a major issue. And if left untreated, stress can lead to a ton of health issues, including headaches, depression, insomnia, heart burn, increased risk of heart attack, high blood pressure, and more. 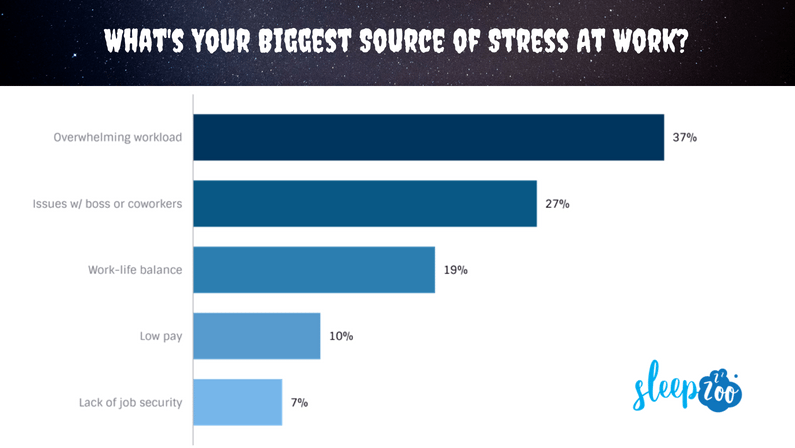 Nearly 2/5 of Americans say an overwhelming or unreasonable workload is their biggest source of stress at work, while others cite problems with co-workers, lack of work-life balance, and bad pay as their main problems. Work-related stress is increasingly a problem for Americans (and people across the world for that matter). Many workers point to the same few issues as their causes of stress on the job, but it’s important to note that everyone is different. What is stressful to one worker might not be a major issue for another, depending on their psychological makeup and other issues. It’s important for companies to start taking work-related stress seriously by taking measures to support their employees and ensure they aren’t subjected to unnecessary stress. Do you ever have dreams about work? What about nightmares about your job? Share your stories by commenting below.